Ah, Sesame Street. Anyone who has ever been a kid remembers the kiddy show where Big Bird, Grover, Elmo, Kermit, the Count and the Cookie Monster taught us our ABC’s. Oh, and there was also Ernie and Bert, those bed-sharing, griping-like-a-married-couple, rainbow-rights activists. Isn’t childhood great?! At home, the Count likes to kick back with his beloved numbers. Of course, station execs were not indifferent to the show’s monumental success. As a result, a slew of Sesame Street-related merchandise was released in subsequent years. There were books, feature films, t-shirts, stuffed toys and even videogames. Yes, videogames. Which brings us to today’s retro review. A while ago, while perusing for something to bash in writing, I came across two Sesame Street titles for the Nintendo Entertainment System. “Oh, great, games for babies! This is going to be fun!”, I thought. But my sarcasm was not to last. In fact, there is abundant evidence to support that it’s impossible to slam Sesame Street. The fact that the games are actually not bad didn’t dispute this. Plus, you must keep in mind that they are not, in fact, aimed at a jaded, snide, sarcastic twentysomething geek anyway. Which is why I took the first of these games, Sesame Street Countdown, straight to its intended audience – my first-grade English class. I recently took a job as an English teacher for foreign students in an elementary school, and whenever I’m not regretting my decision bitterly, I actually manage to have some fun with the kids. The Sesame Street Countdown classes were one such occasion. I took the game to school so that we could review numbers, and the kids had a blast. Sadly, you can’t go in that door. But look! There’s a 1! 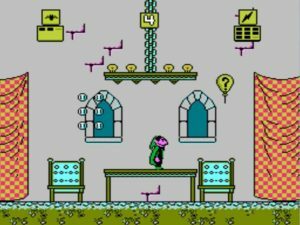 The premise of the game is simplicity itself: you play as the Count, and at the beginning of each level, you pick a random number from a spinning wheel. The Count’s mission is, thereafter, to find the aforementioned number amidst those floating in the sprawling level. It can be represented in numeral form, or via a group of objects adding up to the desired total (e.g. seven ice-cream cones, or five baseballs). Whenever you find one, you get a lighting-bolt; but if you get it wrong, you’re handed a tornado. Too many tornadoes and… you lose. Yes, unlike Barney’s Hide and Seek, Barbie Super Model and other imbecilic kiddie titles, it is actually possible to lose in Sesame Street Countdown. However, if you do lose, it’s all your damn fault for being dumb, since there are no enemies to encumber your journey through the level. In fact, it is surprising that the programmers gave the Count a “crouch” move which he will never, ever need to use. Equally puzzling is the fact that there’s no way to pause the game – pressing start only gives you a tidbit from the Count. But since there is no time limit, that ends up not mattering that much. Being geared towards toddlers and pre-schoolers, this is also, by no means, a taxing game. All you have to do is spot the right number, press A or B, and the Count will jump up and touch it. Repeat as desired, and you’re through to the next level. There’s no time limit for completion, no enemies and not even that platform staple, the pitfall, is present. What you do get are balloons that lead to mini-games in the sky, and extra bolts of lightning, which boost up your final tally at level’s end. As you progress in the game, you start to get more spaces in the “right” box and fewer spaces on the “wrong” box, which means fewer opportunities to make wrong calls before losing. But as far as difficulty goes, that’s pretty much it. In his back yard, the Count keeps his pack of bouncing numbers. Still, being undemanding and simple doesn’t mean it’s not fun. As noted, my kids had a lot of fun cooperating to complete the levels (each round had a different kid moving the Count and another making him jump; the system worked surprisingly well). They also loved the sound effects which – get this – feature actual voice acting from Jerry Nelson, the guy who played the Count on the TV show. And not just a looped two-second sample, either – rather a full array of a good half-a-dozen different phrases, all clearly understandable. 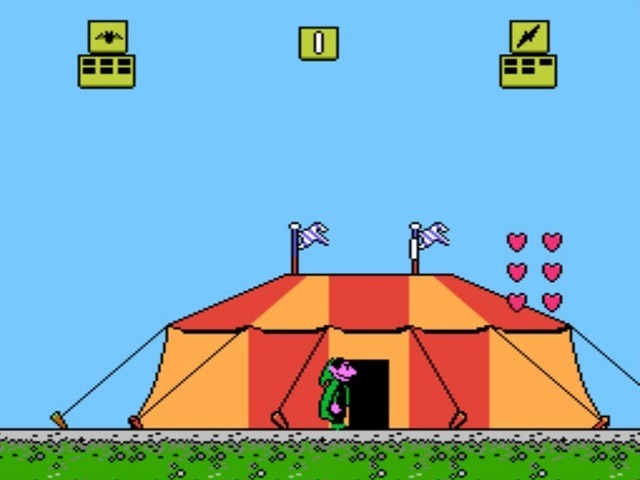 Now, for an NES game, this is nothing short of amazing. If you remember my review of Timon and Pumbaa’s Jungle Games, you’ll recall that one of my gripes was that, unlike on the PC, there was no vocal support to help you figure out what to do. That was on a 16-bit system. This is an 8-bit system. And yet, the Count constantly talks to you, telling you “Got it!” and exclaiming “Let’s go!”, as well as counting up to ten and uttering his trademark cackle. Graphically, it’s all rather detailed. The Count looks like the TV puppet, and the backgrounds and obstacles are different enough for the kids to feel that they’re not merely re-doing previous levels (which, in a way, they are). There are quite a few scenarios, from Sesame Street itself to the Wild West and pre-historic times, although the most popular one with my kids was the one on the Moon (where the jumps suddenly become huge thanks to low-gravity – nice touch!). 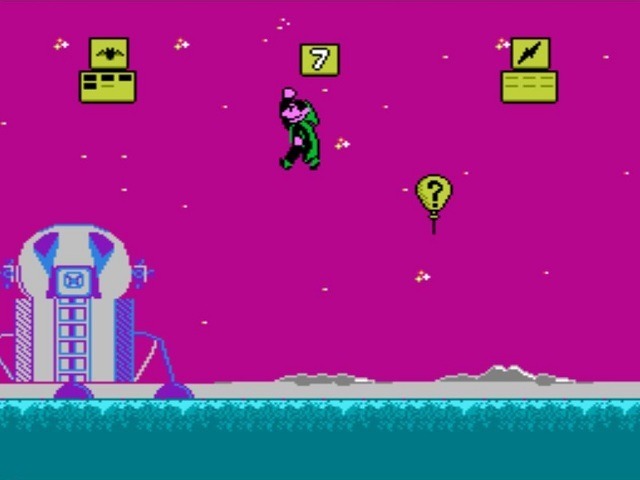 The colour palette, however, is a little drab, relying too much on the Count’s traditional greens and purples, as well as on an uninteresting shade of pale blue. …one giant leap for vampirekind. 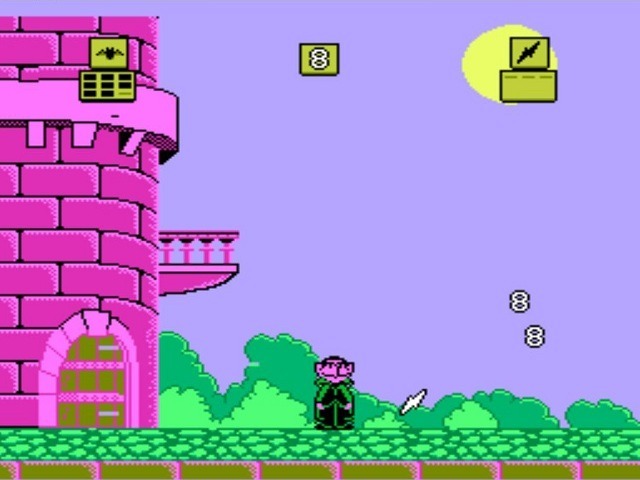 The last level is the Count’s castle itself, and here, both the palette and the irritating music change for the better. I am ashamed to say that on this level, I did not complete the objective first time around. That, however, was not my fault – there were just too few damn fours lying around! On the second go, all this was completed, and I got to see the rather long-winded (but thankfully skippable) ending, with the Count standing on his windowsill and numbers flying by as he names them. Cute for five seconds, but rather boring on the long run. Another thing that fairly baffled them was the mini-games. While they were always anxious to grab the balloons and fly skywards, they subsequently felt some difficulty with some of the activities, particularly the adding and subtracting ones, where there was no visual support. 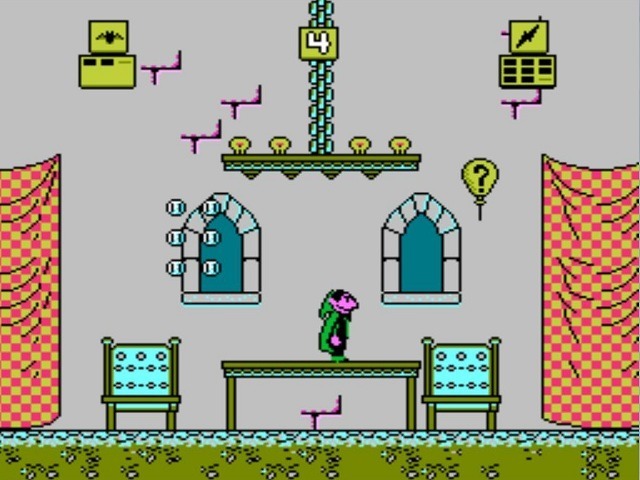 “Find the Number” (whereby you have to find your number hidden in one of five boxes) was deemed “too easy”, and the only adequate mini-game was the one where you have to add or subtract actual objects from the pot, in order to get the desired amount. The fact that there were actual things to count on screen, rather than just arithmetic operations, helped boost the kids’ interest in this game. However, in later levels, they were seen to skip the balloons and just keep on moving forward towards the end. Last of all, some of the numbers were floating too close to points where a jump was necessary, causing inevitable, unforced errors; a quite frustrating situation. Globally, however, the game was a success. The kids loved the Count, and they loved a game that was perfect for their age group. Plus, it’s hard to be mad at a Sesame Street title. Awesome digitized voice. Rather fun for the little tykes. Never openly educational. Decent graphics for the period and system. It’s Sesame Street! Can become repetitive. Annoying music. Mini-games can be too hard for younger children. 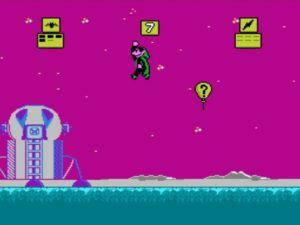 Some jumps cannot be made without accidentally touching a wrong number and making a mistake, which will certainly lead to tears.